Grade I listed former Admiralty Building, behind Robert Adam's Admiralty Screen. Architect Thomas Ripley completed the build in 1725. Now owned by Department for International Development. 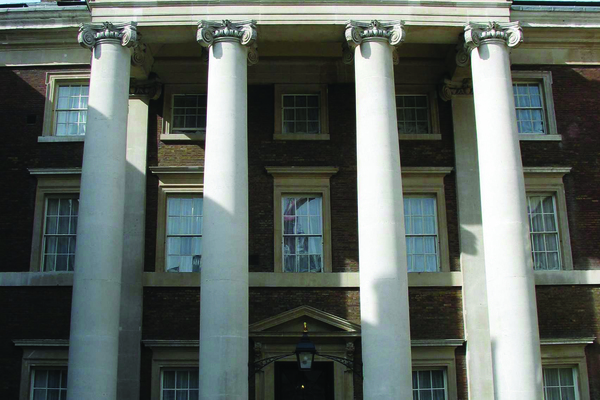 22 Whitehall, the former Admiralty Building, housed the administrators of the Royal Navy from 1725 until the end of the 20th century. Today the building is occupied by the equally outward looking Department for International Development, which leads the UK's work to end extreme poverty and its response to global humanitarian emergencies. The highlight of your visit is the Admiralty Boardroom, still used by the First Sea Lord to direct the operations of today's Royal Navy. The Boardroom, on the first floor of Thomas Ripley's 1725 building, has been used to determine the strategy and the tactics of the Royal Navy since its first occupation. Today, although ownership has transferred to another Government Department, the room is still used by the First Sea Lord and the Admiralty Board; the paintings and objects are exclusively naval in their provenance. The paintings are a William Beechey portrait of William IV, the Leonardo Guzzardi portrait of Admiral Nelson – both were installed in the room in 1847 – and two seascapes; the example to the right of the fireplace dates from 1688 and is by van der Velde the Younger. The ornamental wind dial, circa 1690, is operated by a vane on the roof. The table, together with most of the chairs, dates from the early 18th century; the 1697 clock, which is by Langley Bradley, was imported from the offices of the Navy Board which, prior to their removal to Somerset House in the late 1750s, were located close to the Tower of London. The tradition of the display of Admiralty-derived objects and works of art is maintained in key areas of the building. Works of art such as Clarkson Stanfield's Battle of Trafalgar, on the boardroom stairs, are placed to encourage visitors' awareness of the history and traditions of this remarkable building. The Boardroom's most striking feature is the wooden panelling, together with the carved limewood centrepiece from the studio of Grinling Gibbons, which pre-dates the room's construction. Gibbons, a master wood carver, was discovered by the diarist John Evelyn and examples of his work can be seen within St Paul's Cathedral and Hampton Court. The centre panel, with its 'eye in glory' motif – symbolic of the 'Divine Right of Kings' – was probably rescued from the Palace of Whitehall after much of the site was destroyed by fire in 1698. The side panels show navigational instruments of the mid-17th century, surrounded by garlands and fish. Photography is not permitted anywhere inside. Please do not bring large bags/rucksacks as storage is limited.